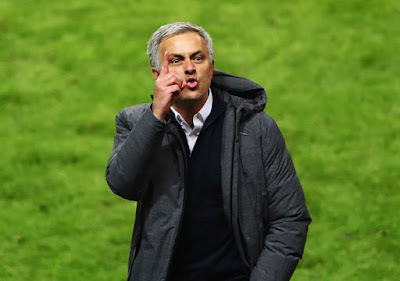 MOURINHO: "MY PLAYERS DESERVE MORE CREDIT FOR SPURS WIN"
Manchester United manager Jose Mourinho strongly believes his players deserve more credit for recent results and performances in all competitions. The Reds are currently second in the Premier League after 10 matches, top of Group A in the UEFA Champions League (with 12 points from 12) and safely through to the Carabao Cup fifth round. United have also scored 38 goals in total, which is 14 more than at this stage of last campaign. During a press conference at the Aon Training Complex to preview this Sunday’s match at Chelsea, Mourinho was asked by one reporter if good results are not good enough for some people. “I don't want to comment,” the boss explained. "Because if I comment I am going to do a job that is not my job. Sometimes I feel that I could or I should, but other times I cool down and I think that I shouldn’t and I'm not going to do that. “I know there are different ways of analysing things for this reason or that. Similar performances for other clubs are magic, are examples of brilliant tactics and amazing attitudes by the players. For other teams, the same kind of performance becomes conservative, negative, so many adjectives. Of course, Mourinho will always be intrinsically linked to Chelsea because he is the most successful manager in their history. However, the boss pointed out to reporters that his return to Stamford Bridge this weekend is not the reason why the Premier League fixture is so anticipated. “It isn’t a big thing,” he told reporters. “It is normal, it is football, it is professionalism, it is football life. One day you are in one club, one day you’re in another club. It’s a big thing because it’s a big match, because it's a big opponent, they are the champions, because it's one of these matches between the top teams in the country, but by the emotional point of view it's just one more game. “I played there with Inter and twice with Manchester United. I have to admit it's a little bit different, but in the end, I want to win, like I did with Inter, and they want to win like they did last season. “It’s just one more game, in a couple of years it will be even more natural and in four or five more years nobody will probably remember that I was Chelsea manager and it will be completely normal.